MIDDLEFIELD, Conn. (March 22, 2019) – The light at the end of the tunnel known as “Winter” begins to shine brighter as temperatures rise and the fruit trees start to emerge from hibernation. Signaling that spring is right around the corner, Lyman Orchards announces that its three golf courses – the Robert Trent Jones Course, The Gary Player Signature Course and the Apple Nine Course will all be open for play this weekend to officially kick off the 2019 season. Golfers helping to line up the putt on the Gary Player Course. 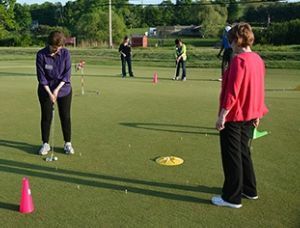 Ladies Golf Instructional programs kick off for the season on March 23rd. The Jones Course, designed by famed golf course architect Robert Trent Jones, Sr., is a breathtaking 18-hole course that is among every golfer's favorites. Featuring rolling hills on the front nine and varying dog-legs on the back, the course meanders through acres of woodlands, wetlands, and grasslands. Four sets of tees on each hole, coupled with 44 bunkers mixed in, provide a unique challenge to players of all abilities. On the back nine, water comes into play on seven holes, and the undulating slope of the greens will challenge both astute and novice players. The Player Course features picturesque views of the Connecticut landscape, including a complete 360-degree view of the New England scenery on holes 11 and 13. This course, which was designed by Gary Player, the winner of 165 professional golf tournaments and one of only five men to capture the golf Grand Slam, rewards well-positioned drives and accurate iron play with 34 bunkers protecting relatively small greens. It also boasts newly installed sand traps that will make the experience of landing in them more pleasurable. Playing anywhere from 4,667 yards to 6,600 yards, the Player Course is ideal for all skill levels. The Apple Nine Course, a 9-hole, 1,600 yard course is less intimidating for novices yet challenging for experienced golfers looking to shave strokes off their game. The par-29 course wraps around one of Golf Range Association of America’s Top 50 Stand Alone hitting ranges in the US and provides a unique learning and playing experience for golfers of all ages and abilities. Instructional programs for those looking to learn the game of golf begin in earnest on March 23rd. 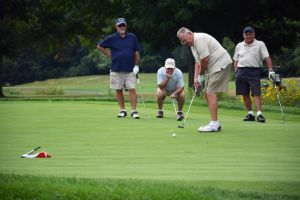 With rounds starting at $25 for nine holes, the Lyman Orchards Golf Club provides a premium golf experience at an affordable price. Avid players can also utilize the Advantage Card or Player Development Program Card for further savings and benefits. Please be advised that, for the time being, The Apple Nine courses will only be open to walking golfers. In the coming weeks guests can look forward to carts being permitted and for the ranges to open. Carts are available on the Jones and Player Courses. If you want to learn more, or are looking to book a tee time, please visit www.lymangolf.com. Set on 1,100 acres in the heart of Connecticut, Lyman Orchards (est. 1741) is a year-round destination for the whole family in Middlefield. Shop at the Apple Barrel farm market, filled with fresh produce and Lyman Orchards’ award-winning "Hi Top" Apple Pie; celebrate special events and weddings at the Lyman Homestead; enjoy seasonal Pick Your Own fruits and tours of the orchard; golf on two world-class, public 18-hole courses designed by Gary Player and Robert Trent Jones, and improve your skills at the Lyman Orchards Golf Center and Apple Nine Course. For more information, call Lyman Orchards at 860-349-1793, or visit us at www.lymanorchards.com.